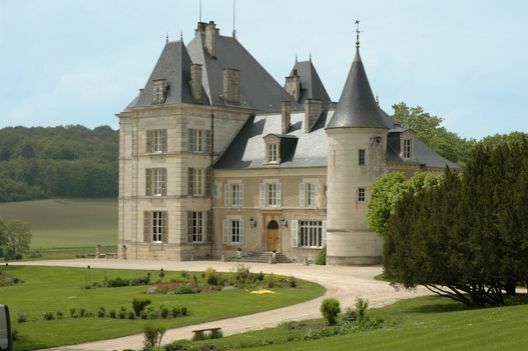 Owned by the Rapeneau family, the estate vineyards of Chateau de Bligny are in the Cote de Bar in the southern part of Champagne. Ch. 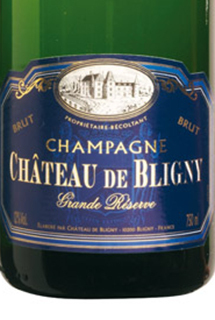 de Bligny is one of the few producing chateaux in Champagne and processes one of t few old clos (walled vineyard) of Champagne. They are also unique in growing all the legal grapes for Champagne. A blend of 50% Pinot Noir and 50% Chardonnay, 100% estate bottled & produced from their vineyards in the Cote des Bar. 15% Reserve wines and full malo-lactic fermentation. Aged 24 months on the yeasts. Dosed to 10 grams per liter sugar. Straw-colored and fully sparkling; dry, medium-bodied with freshly acidity; scant phenolics. Clean, fresh and focused with citrus and some tree fruit and more mineral than toast but the toast is present and accounted for. Very much in the stylistic middle of Champagne. Evolves nicely in the glass. BearScore: 91. A 100% Chardonnay estate bottled Cote des Bar Champagne with 15% reserve wine, gets a full malo-lactic fermentation and is aged 24 months on the yeasts. Dosage at 10 grams per liter. Straw in color and fully sparkling; dry, medium light-bodied with fresh acidity and scant phenolics. Clean, pure, focused, fresh mostly citrus fruit with limestone mineral and subtle toast. Delicious. Made more in the blanc de blancs aperitif style but with enough richness to handle some food. BearScore: 91+. A 50% Chardonnay, 50% Pinot Noir (30% of which is red Coteaux Champenois). 15% of the total cuvee is reserve wines. Full malo-lactic fermentation and and aged at least 24 months on the yeast. Dosed to 10 grams-per-liter of sugar) Orange-salmon in color and fully sparkling; dry, medium-bodied with fresh acidity and very light phenolics. Clean and fresh with red (strawberry and raspberry) fruit and citrus over limestone mineral and notes of toast and spice. Rich enough to drink with dinner. BearScore: 93. An estate-bottled, single-clos blend of equal parts Chardonnay, Pinot Noir, Arbane, Pinot Meunier, Petit Meslier, and Pinot Blanc (six of the seven varieties legal in Champagne) from the Bligny estate’s clos (walled vineyard) in Champagne’s Cote des Bar given a full malo-lactic fermentation, aged 3 years on the yeasts and dosed at a very dry 5 grams per liter. Pale-gold-straw in color and fully sparkling; dry, medium-bodied with freshly balanced acidity and very light phenolics. Richer riper more complex and developed style of Champagne with more earthy vinous character. Fine mix of citrus and tree fruit with mineral and toast. complex, textured, and dimensional. Excels both as wine and as sparkling wine. Stunningly good if unknown effort from a newish estate. BearScore: 95. Seriously good, check it out.